As a little boy, growing up in Ohio, David was fascinated by his older cousin’s collection of movie star paper dolls from the 1940s and ‘50s. The glamour of fashion and film resonated with the artistic, bookish child and set him on a path that would lead to a highly successful career in the fashion industry. The paper dolls and coloring books were put aside as David grew up. After graduating, he worked for a small town department store for a few years. Then, David moved to London while it was the hot spot for swinging ‘60s style. He became one of Europe’s leading fashion illustrators with work appearing in The London Sunday Times, British Vogue and Women’s Wear Daily. He produced advertising artwork for fashion stores such as Selfridges and Liberty in London and Galeries Lafayette in Paris. As the ‘70s began, David added another dimension to his creativity when he became one of the world’s first fashion trend forecasters. That job took him to front row seats at fashion shows in Milan, Florence, Paris, New York, Los Angeles and even Tokyo. He is today the Creative Director of The Doneger Group, an important fashion consultancy firm based in New York City. His forecast presentations of incoming fashion trends are seen by designers and retailers such as Nordstrom, J.C. Penney, Liz Claiborne, QVC, The Fashion Institute of Technology and many fashion clubs and organizations. Today David Wolfe is considered an international authority of renown, the most widely quoted personality in fashion. When not traveling to Europe, Las Vegas, Los Angeles or Paris, he divides his time between residences in Manhattan’s Greenwich Village and a country house in the Litchfield Hills of Western Connecticut. David shares his knowledge of fashion history with student groups by guest lecturing at schools and colleges including FIT (Fashion Institute of Technology) and LIM College in New York, as well as FIDM (Fashion Institute of Design and Merchandising) in Los Angeles. Paper dolls came back into David’s life a few years ago when he discovered the community of collectors and artists dedicated to keeping alive the passion that he had as a child. 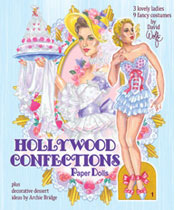 He is a contributing editor to Paper Doll Studio and frequently produces features for Paperdoll Review magazine, too. Having ended his career as a fashion illustrator long ago, David is happy that paper dolls allow him to again create glamorous artwork. His recognizable style is a very deliberate recreation of the lush, lavish technique employed by artists during the 1940s and ‘50s, the golden years of paper dolls. 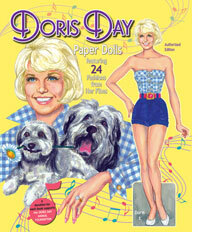 Among the stars David has transformed into paper dolls are Debbie Reynolds, Doris Day, Donna Reed, Marlene Dietrich, Carol Channing, Patti Page, Veronica Lake, Marsha Hunt, Phyllis Diller and Phyllis McGuire. His fashion subjects often include costumes from the big screen including Hollywood Style of the 30s, 40s, 50s, Hollywood Confections, Adrian Fashion Designer, Hollywood Style of the 60s, 70s, 80s. Other subjects include Polka Dot Paper Dolls and TV Moms of the 1950s, Merrie Christmas and David Wolfe's Fashions that Rocked and Wrecked the Red Carpet.